The washer reservoir is in the frunk, as you might expect since it’s right next to the squirty things. But the frunk isn’t like an engine bay, it’s a storage space. Sort of like what you get under the boot floor really. So if you’re careless and spill some water, it’s going to run under the plastics and pool in the bottom of the frunk where you can’t reach it to clean it up. So you’ll have to remove the warning triangle thing and the Toyota tools, and the spare tire, and spend too much time fiddling around trying to get all the water out. And waiting for it to drain to the bottom of the frunk so you can reach it, for fear of future rust and regret. On the plus side I found where the battery lives. 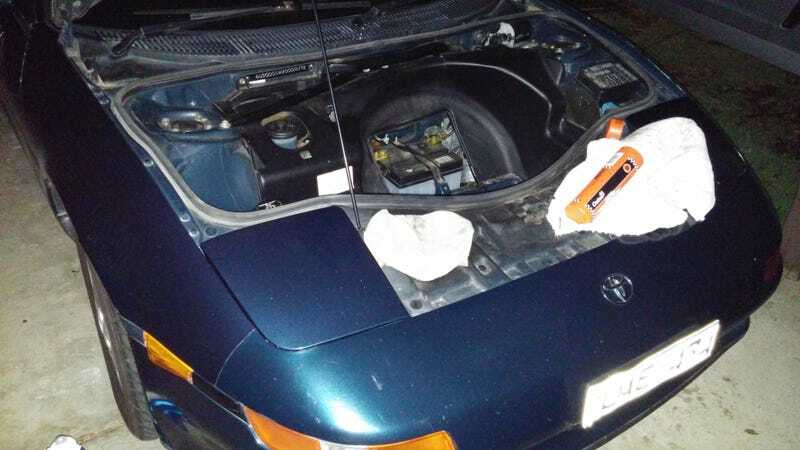 As an aside, the MR2 has generated a noise. A ticking from the engine at something like 20%-30% throttle - right where you need to be to maintain a constant speed. It’s become a real downer for me. I’ve loved driving this car since I got it, a very exciting upgrade from the heavier, lazier 300ZX. I’ve loved it so much that, now that it’s got a flaw, it’s bringing me way down. I need it to be good for me. I’m dependent on it. A 26 year old Toyota without a turbo has become my drug. I’m not ashamed to say I walked to the shop instead of driving because I just can’t take the shame. Also these photos were taken in the dark because daylight savings has ended and so has Summer and it’s going to be constantly dark until September rolls around.